SHOP MERCH: Logo T-Shirts, Ceramic Mugs, Travel Cups, and Candy/Pasta/Pet-Treat Jars available at our booth at Third Street Market (520 S. Third St., in Greenville). Get your limited edition collectables before they’re gone! We have been so busy celebrating our Bond County, Illinois’s Bicentennial this year and more many exciting plans are underway. Please check this website often so that you can plan to participate in each and every remaining event. LIKE our Facebook Page so you don’t miss any information on our exciting celebrations or fundraisers. Downtown Greenville Event: Music by Head East on the Bradford National Bank Main Stage; Swamp Weiss & the Swampdaddies; & open mic Bond County jam. Also Bond County Historical Museum Exhibit opens in the Old Masonic Building. VIEW full July 2, 2017 Event Schedule, Map, Parade Form, non-food Vendor & additional information. Downtown Greenville Events: Courthouse Tours, Museum Exhibit continues, Parade @ 3pm, Vendors, Beer, Food, Music (including headlining concert by Ides of March with Jim Peterik), Fireworks (accompanied by The United States Air Force Band of Mid-America), and post-fireworks music performance by Brother Jefferson Band ft Jeff Chapman. Hill’s Fort Rendezvous at the Hill’s Fort Reconstruction Site, on the grounds of AFHM south of Greenville. Friday is School Day! Saturday and Sunday open to the public. More Details TBA. The first lots of the city of Greenville were laid out by land and business owner George Davidson in 1815. Less than two years later, on January 4, 1817, Bond County was formed out of Madison County to its west; and, on the 3rd of December, 1818, Illinois became the 21st state of the Union. Greenville was established as the county seat of Bond County in 1821. Read more about our county’s Rich History! In 2017, Bond County celebrates its 200th anniversary. 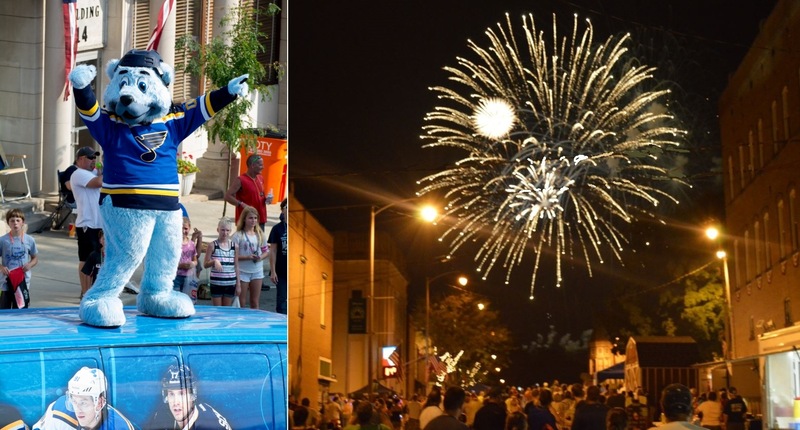 The Bicentennial Planning Committee of Bond County, Illinois is sponsored in part by the non-profit organization Bond County Historical Society and has been formed to plan and organize events in preparation for the months-long celebration. Celebrate Bond County’s 200th birthday with events, exhibits, tours, and commemorations from January through September of our Bicentennial year. Click Events for our full schedule, or check back on our Welcome page to find out what’s happening next. Our Bicentennial is an historic year to visit Bond County. To plan your trip, visit or contact the Greenville Tourism Office inside the Greenville Chamber of Commerce for information on lodging, dining, recreation, and entertainment based in the county seat of Greenville, Illinois. One of the most important aspects of the Bicentennial Planning Committee is to encourage active support and involvement with our fellow Bond County, Illinois citizens. Without a great deal of volunteer effort and cooperation, projects of this scope simply would not be possible. With your help we can make the 2017 bicentennial of Bond County an historic event to remember in all of our communities! Copyright 2016 Bond County Bicentennial & Bond County Historical Society. All rights reserved. Web Development & Management by rainofhearts.